This is a perfect solution for balancing you guidescope or piggybacked camera. 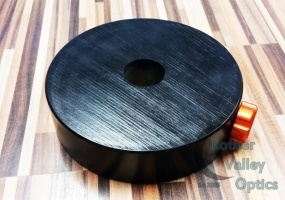 This accessory is for the dovetail counterweight only. If the dovetail bar is needed please order the MDS Dovetail Counterweight Kit. These bespoke counterweights from ADM, are ideal if you are wanting to put a lighter scope on your CGE Pro or CGEM DX mount. Sometimes the supplied counterweight is too heavy to obtain a perfect balance. This is a perfect solution for balancing you guidescope or piggybacked camera. The attachment bar is made from 5/8" 6061 Aluminum. It is 1.5" wide with a small channel machined in the underside for a perfect fit.